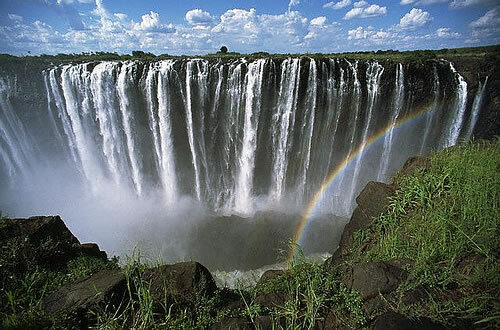 The Victoria falls is 1 708 meters wide, making it the largest curtain of water in the world. It drops between 90m and 107m into the Zambezi Gorge and an average of 550,000 cubic metres of water plummet over the edge every minute. The Smoke that Thunders is a suitable name for this impressive waterfall. You can hear the roar from afar and feel the power when you are up close. The falls and the surrounding area have been declared National Parks and a World Heritage Site, thus preserving the area from excessive commercialisation. The Falls are spectacular throughout the year, but February onwards, after the rain season, has the heaviest flow and volume of spray. Dry Season: May to October, with better photo opportunities in September and October as there is much less spray. NB: If you don’t like to get wet and are a keen wildlife enthusiast then this is a very good season to visit the falls. However, please notice that the waterfalls are much less impressive at the time due to the lower water levels. Rainy Season: November to April, with the Victoria Falls at their peak in April. NB: Not the best of seasons to view the full width of the falls while on foot, but the aerial view is absolutely breathtaking!